When I started writing this post, I was faced with a difficult task of naming a feeling. I sat down and stared blankly at my computer, wondering how I’d call it. As the sun slowly set in the horizon, the sunset expanded brightly through the sky, as if someone had been playing with yellow and red leaves. In my quest to make clear what I had in my mind, I came across the definition of “being moved”, which can mean the same as to “stir the emotions of a person or group. It suggests a strong or deep emotional impact that is often expressed openly.” I decided to go with it, even if it is far from being a perfect word to describe it. In fact, I simply don’t know how to define this strong and enormous feeling, mostly because there are various degrees of “being moved”. The same thing happens with people. There are people we love; our relatives, our closest friends, our husband or wife, our children. But there is a different kind of interaction which I have trouble defining: when I meet someone who moves me. A person who deeply affects me, not in a romantic or friendly sense, but in a unique, profound and impactful sense. Some of these people come and go abruptly, leaving you with words, images and thoughts that change you forever. Over the last years, I noticed there were several authors whose work moved me. We are moved by an author due to several different reasons. We might appreciate the way they entrance us through a captivating plot, using words like threads of a web, their arachnid eyes chasing us through their sentences. We might feel enthusiastic with their bold style, with the sort of novelty that is not sold on supermarkets. Or we might admire their characters, their worlds, the laws and beliefs that sometimes seem even more plausible than those to which we are subjugated. We all have authors and books that we admire. I could choose several who have touched and surprised me: Haruki Murakami and his volatile and mysterious stories; Stefan Zweig and his social critique; Gabriel García Marquez and his magical realism; Virginia Woolf and her poetic narrative. But in the course of our lives, there are a number of authors who move us deeply and provoke a deeper impact. Something in their works, phrases and ideas - perhaps an echo, a whisper – vibrates our heart’s tendinous cords, making them shiver and tremble like clothes in the wind. I do not intend to review all the books that have awakened in me this myriad of unique sensations, but I would like to write about two particular authors that have moved me in recent years. Deep down, I feel as if I am writing a letter to these authors - a letter without a destination, a silent ode of gratitude. In May 2016, I wrote down some words in my notebook after I had finished reading my first book by Patti Smith, "M Train”. "M Train" is itself the product of Patti Smith’s notebook’s writings, a kind of autobiographical work that portrays her thoughts, her wanderings through cafes, her memories, readings and reflections. "M Train" lives in the shadow of "Just Kids", the American singer's most popular work, which portrays her years of youth and her relationship with Robert Mapplethorpe. However, I chose "M Train” only by a matter of availability on my usual bookstore. 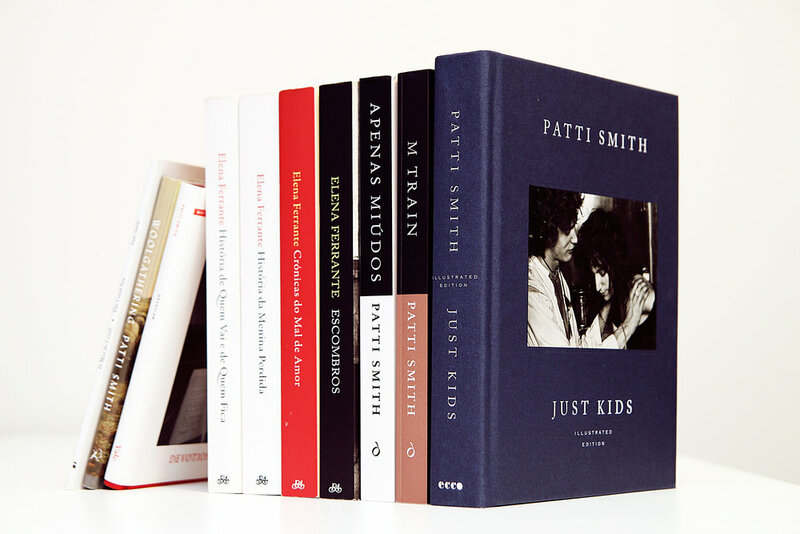 What prompted me to read something written by Patti Smith? It was surely because I had had the pleasure of watching her concert back in 2015. Until then, I had never explored the discography of Patti Smith, although I was aware of her influence on music in general. Everything else about her was unknown for me. As a side note, I must say that until then I had always distrusted writers who kept another parallel artistic activity. Patti Smith was no exception. Perhaps my suspicion dates back to a time when many popular actors and musicians published self-help books and autobiographies. I now know that distrust was a form of personal bias, even if I didn’t know it when I first started reading “M Train”. Let's go back to the moment I read "M Train". Something in me was suspended in Patti Smith’s words - not because of her lyricism, but because of her honest ability to translate contradictory feelings through her writing, feelings which seemed inherent to my own being. Whole scenes where slowly built in my mind, scenes that transcended the photographs that illustrated some of the passages in the book. Patti Smith talks about writing in a way that did not scare me. During my life I have tried - and read - several books on the art of writing. Advice from writers, reflections on how best to complete and publish a book. Most of these works, however, aroused in me an endless fear of failure and of generic and empty opinions and critics. To read Patti Smith was to find a calm voice amidst the background noise of a society in perpetual movement, thirsting for competition. Simultaneously, reading Patti Smith was to see validated emotions I rarely reveal to other people. The identification with some passages was so intense that it forced me to pause and reflect on its content. Why did I empathize with Patti Smith’s words? I would never live what she did nor would I be able to imagine exactly what she felt on her own time - and yet my body and thoughts slowly became one with her words and ideas. The moments described in the book took the form of instant snapshots which I would vividly remember in the following days as something tangible and real. Through her work, Patti Smith had taught me to nurture those feelings, those tiny obsessions as a form of symbiosis with oneself and with life itself. This feeling endured for a few days, in the same way a fond memory does; however, it eventually dissipated. I read all of Patti Smith’s books that I could get my hands on and in all of them the same original feeling keep resurfacing repetadly. After finishing her published work, I turned to her social media presence and, despite still admiring her, I feel that the special connection I just described only seems to come up with her literary pieces. A few months had gone by. April had returned and with it a light drizzle whose persistence echoed slivers of eternity. In that day, traces of light drained through a body of dense and dark clouds, whose softness imparted it a celestial and undying nature. I found myself in a city close to the sea, where seagulls screamed distant and cryptic words as they flew overhead. I had lived in this city a few years ago and the avenues, shops and naked trees all felt strangely familiar. Nostalgia took over me and I felt the same happiness that had been present when I took my trips there and met some people with whom I experienced moments of happiness and discovery. In moments like these, I usually end up at bookshops, as if compelled by a thirst for words, and that day was no exception. As I sat in my favorite café with “My Brilliant Friend”, I wondered what lead me to choose that particular book. Perhaps it had been its white contours and the solemn look of the girl in the monochromatic picture on the cover or even perhaps a long-forgotten review stored somewhere in my mind. Yet none of this was intentional. Elena Ferrante’s books have often described as being “addictive” in the sense that they force the reader to devour its paragraphs in order to learn the characters journey. Something snapped in my mind as I read the detailed description of Lila Cerullo’s dissolving boundaries phenomenon, as described by Elena Greco, the story’s narrator and Lila’s childhood friend. The feeling of depersonalization had always impressed me greatly and reading such a beautiful description of this phenomenon stole my breath, as if a wave had burst through that café and kept me from breathing. I felt my hands shaking over the printed page, as if swayed by dozens of silent tones. After reading the 4 books of the so called “Neapolitan Novels”, something in me had changed; something invisible to other people but forever present. Some might define all of this as empathy. In some situations, I do believe that art serves as an empathy-learning vehicle. However, all that I’ve described goes beyond that definition. It is, if you will, the ultimate expression of inspiration and creative unquiet. As I see it, it is the utmost purpose of an artist to express oneself and perhaps, with some luck, to awaken in another human being something that will move and lead him or her to change socially, politically and artistically. Susan Sontag once said “I water my mind with books.” Few quotes are as meaningful as this one but I would add that books go beyond the mind and also influence one’s spirit, heart, body and ultimately one’s existence. Whether with books, music or films, let us water our existence with experiences that move us and leads us to question everything around us - that is the true importance of art and literature.